Alex and I often take it in turns to cater for the Formula 1 events. The arrangement is very loose as there is no ways I am doing breakfast on a Sunday for anyone but Dave and I, and some of the races are late at night. But when we feel like it we get together and watch the race at either our place or Alex’s. The only thing that we make sure we do is cater for the race with a meal from the country where the event is taking place. Alex got the easy one of Italy and I was left with Singapore. A few years ago I won a book called Food and Travels Asia by Alistair Hendy, and I was so grateful for this coffee table book. 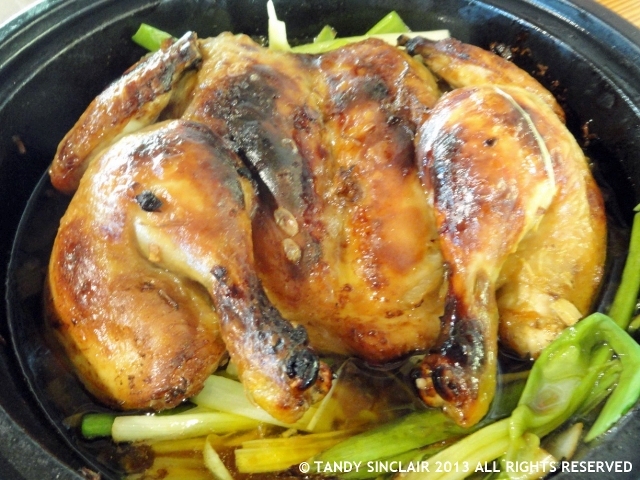 It had this recipe for nonya pot braised chicken and the chicken was so good that Alex has asked me for the recipe. I had no intention of blogging the recipe when I made it, or when I took the photograph but it is so good that I had to share it with you all as well. I would not wait for the next Singapore Formula 1 race to make this – it is so good and so easy to do that I am going to keep this as a must do, must repeat often recipe in my repertoire. Do you watch the Formula 1 racing? I am in Italy until the 30th of October and will reply to blog comments then. If you want to follow along on our holiday please read our daily blog here. Wow ! That’s sounds great. For any suggestions or help, you are most welcome. Oh wow, This looks yummy! I would like to try this at home. I used to work at Shell Malaysia many years ago and had the privilege of meeting many F1 drivers those days, including famed Michael Schumacher! I am really missing the Singaporean food at the moment. I see you have just posted about Singapore! It was a really delicious meal! Oh wow, that looks amazing Tandy! Save me the legs please? 😉 Delicious! That looks awsolutel incredible – what an amazing dish…am definitely goint to make this. I’m not much into watchin the F1 but Big Man loves it! This looks and sounds just divine! I don’t watch racing but I do love the look of your chicken. I have watched racing for as long as I can remember! What a great idea to cook something from the country where they are racing Tandy and this chicken sounds great.